The $342 price tag can be tough to swallow. What this really comes down to is the uniqueness of the design and the quality of Hard Graft products. You know those minimal wallets that are all the rage? The Flat Pack is of a similar breed, but bag-sized. 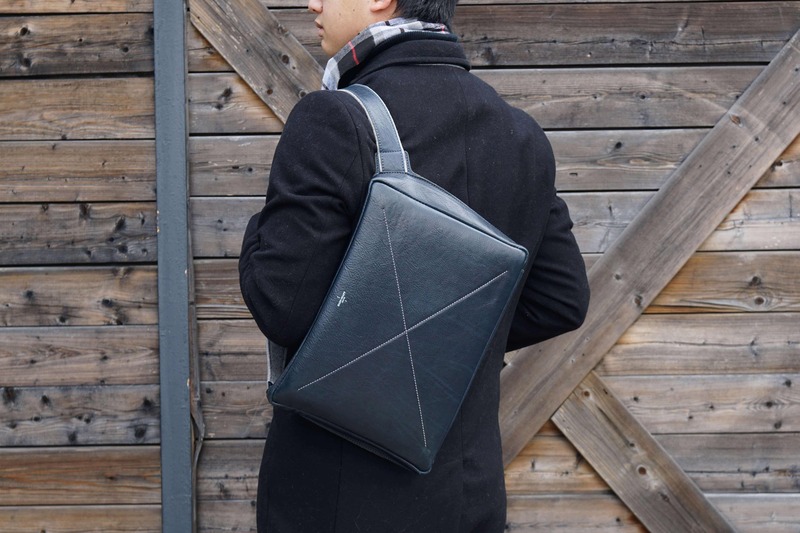 The Hard Graft Flat Pack is structured like a laptop folio, but with a leather-and-wool shoulder strap that lets you wear the bag high on the back, like a bicycle courier pack. I’ve had this bag for almost a year now and I’m still finding different ways to use and carry it. Hard Graft designed this for days when you want a very light carry to the office, or for casual day trips while on vacation. The Flat Pack is lovely if you’re aware of the bare minimum you really need to carry, and its design challenges you to accomplish this. It may sound absurd to talk about a $342 USD bag “challenging” its owner to do anything, but this bag can be very rewarding to use, so long as your setup fits the bill. The Flat Pack comes in a few different colors: a Classic brown, Atelier black, a Neutral grey, and an Ocean blue. I pored over those choices for months and ultimately decided on the Ocean edition. This bag is as much an item of clothing as it is a piece of gear, and the prospect of blue leather felt novel to me, as I’ve only ever owned bags in black, brown, or grey. After nearly a year of use, I’m still happy with this choice. The blue has darkened beautifully over time, and little scratches have been very easy to buff out, leaving the whole design looking as clean as when I bought it. The bag is quite comfortable when tossed over one shoulder. It can’t fit very much, so it’s usually very light. I try to keep the bag out of the rain as much as possible, but I’ve gotten caught unaware a few times. My trick for drying this bag is to wipe all the water off with a towel and then let it air dry at room temperature. This has left the bag quite supple, and I haven’t felt the need to use any conditioner on it yet. Hard Graft’s leather really is some of the best stuff out there. The Flat Pack’s single storage compartment is designed to carry a 13-inch MacBook Pro or 12-inch MacBook, but it also fits Apple’s new iPad Pro perfectly. 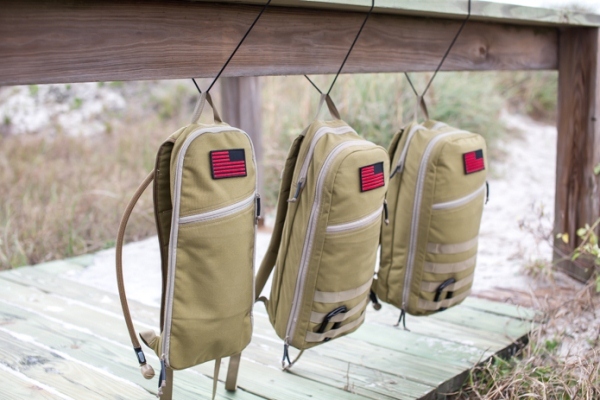 There’s a strip of fabric that runs along the rear of the bag to separate your main device from all of your other gear. This fabric doesn’t have any padding, but it will stop metal (say, from a pen clip) from making contact with my devices. 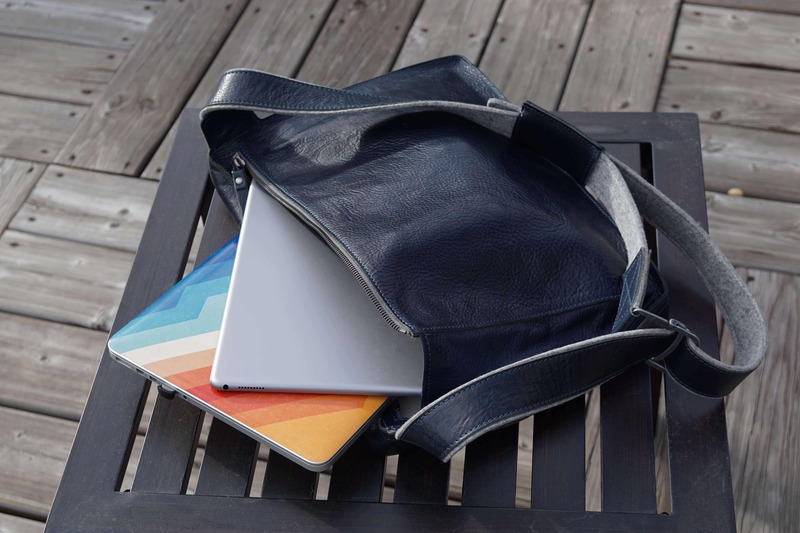 The main compartment is designed to fit just enough: 13-inch MacBook Pro, iPad Pro, wallet, and a few chargers and cables. Smaller items, like pens, my Leatherman Charge, and the Apple Pencil, fit into a small interior pocket. This space is also great for storing a wallet, if you’re into the habit of keeping one in your bag. It would have been nice to have some sort of seal for this pocket (the top always stays open), but in practice, this has never been an issue. The bag stays vertical most of the time, so nothing falls out. The only issue you might encounter is if you keep loose change in here — that would definitely roll around, especially when you place the bag flat on a table. This small item pocket is useful for attaching pens and multi-tools. You won’t want to place loose change here because there’s no way to close the actual pocket, only the bag. A single zipper runs along the top of the Flat Pack, allowing you to seal it securely. This zipper is only accessible from the rear, so you don’t have to worry about anyone taking things out of the Flat Pack while you’re wearing it. My iPad Pro and MacBook can sometimes graze the zipper when I put them into the bag, but I haven’t ever had it scratch my devices as a result. I’m able to comfortably fit a Moleskine journal and a gray canvas pouch alongside my iPad Pro. I can push the Flat Pack a bit more by storing my Sony A6000 along the bottom of the bag, so long as I invert my lens hood. On rainy days, I can also fit a compact umbrella in the Flat Pack, so long as I store it along the top, where the zipper closes. 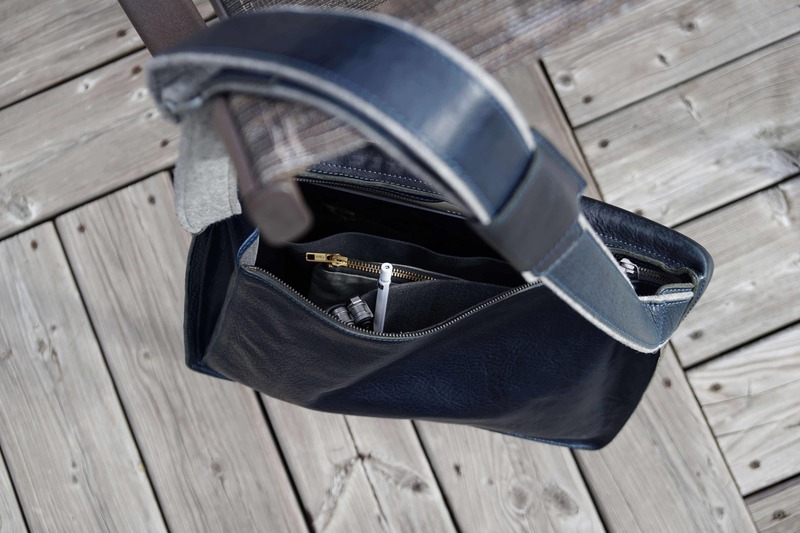 The bag is sealed by running the zipper to the left, and an accordion-folded flap of leather provides full access to the contents, while also preventing little items from falling out. This flap of leather is something I learned to pay attention to, as it can impact the clean look of the Flat Pack if it doesn’t close properly. Packing the bag too full of stuff keeps the flap from folding, which makes the left side of the bag bulge a little. This doesn’t look too bad while you’re packing the bag, but close it up and look at it from the front (how other people would see it on you), and you’ll see an unsightly bulge. The lesson here is to simply stuff bulkier items toward the middle of the Flat Pack so that it can close properly. Hard Graft’s site shows two main ways of carrying the Flat Pack around: in the hand as a folio, or high on the back like a courier’s pack. 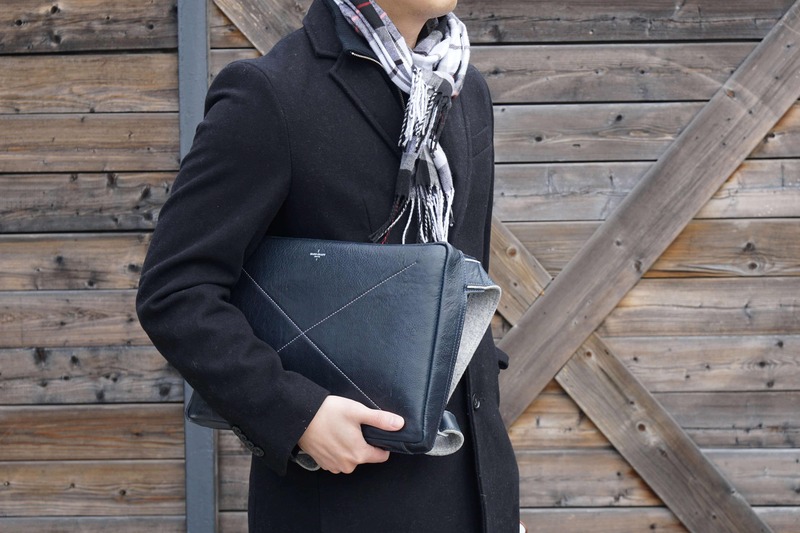 Truth be told, I’ve never understood the appeal of a laptop folio. The Flat Pack can be carried like a laptop folio for short distances. Unless your only concern is getting a laptop from your vehicle to your office, I’d find it incredibly inconvenient to have one hand taken up at all times. I can tuck the Flat Pack under my arm for quick jaunts, but I usually prefer to just sling it over my shoulder in those cases. 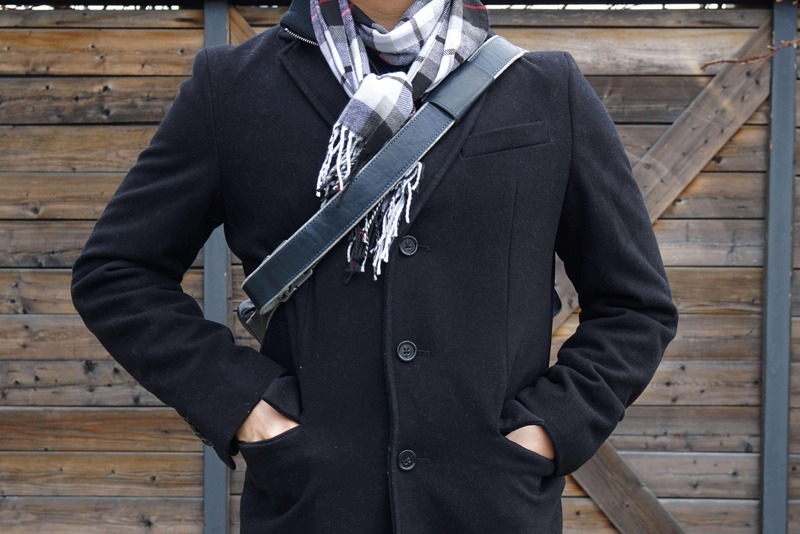 The wool felt and leather combo make for a very clean shoulder strap. Wearing the Flat Pack cross-body is my favorite way to carry it. The zippered compartment rests against my back, with the small items pocket (containing my Pencil, Leatherman, etc.) closest to me. I’ve read concerns from other Flat Pack owners about chargers or similarly shaped items digging into their backs, but I’ve never been bothered by this. My Flat Pack is usually too light to actually press against my body due to weight alone. The downside to wearing this bag cross-body is that you have to treat it more like a backpack — you take it off in order to access your stuff. Hard Graft’s cross-body pictures are rather misleading, as their promo shots show the shoulder strap very close to the neck. This often bites into the collar of my winter coats, or starts to hurt my shoulder if I carry the bag for a while. You won’t want to keep the strap too short either, as it can become difficult to take the bag off. The pictures in this review are truer to what this bag actually looks like in use, and I’ve found a happy medium by carrying the bag in the small of my back, with the strap sitting in the middle of my shoulder. But there’s also a third option for wearing the Flat Pack, which is to keep the strap loose and wear it like you would a messenger bag. It sits just at the hip and makes all of the contents easier to access, as a result. I’ve preferred the cross-body carry overall because it keeps the weight closer to my body and prevents the bag from swinging around, but I might start to do this with my iPad Pro (which is less than half the weight of my MacBook Pro). 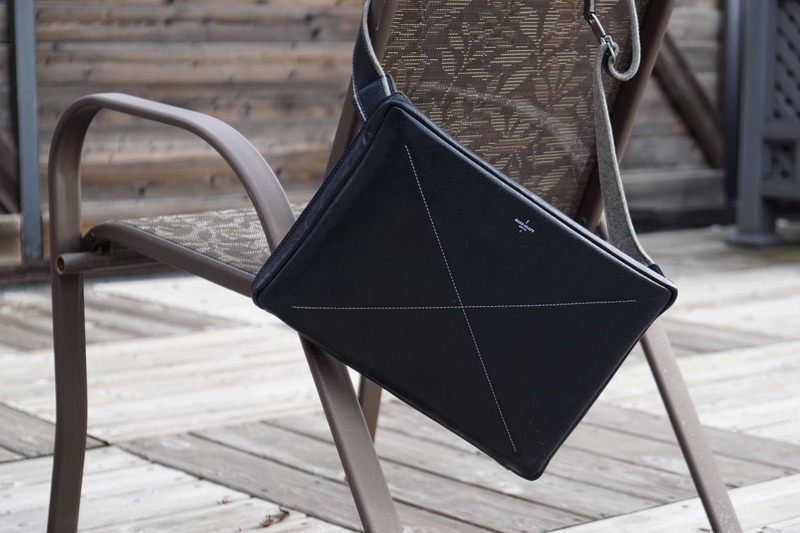 The promise of this bag lies in its minimal design. It’s so flat and small that you no longer have to worry about bumping other people in crowded areas. It’s also a great bag for stowing at restaurants or coat-checks, since it can be hung on your chair (without touching the ground), or tucked away with a coat. The Flat Pack hangs nicely from the chair while you sit down to eat. No need to place your bag on the floor or tuck it in the corner. The Flat Pack is also a fantastic travelling companion. You can tuck your passport into the small items pocket for quick access, then stow the whole thing under an airplane seat without giving up your legroom. When you’re walking around a foreign city, you won’t need to worry about errant hands accessing your gear because of the rear-facing zipper. The leather on the Flat Pack is pretty thick, too, so it stands up very well to daily abuse. It took me a while to adjust to this design because so many bags emphasize storing as much as you can — in contrast, the Flat Pack insists on storing only as much as you need. 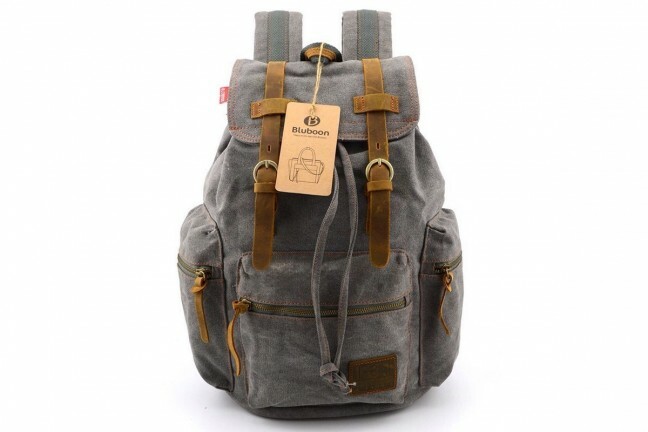 That means it’s really best for people who want to keep their everyday carry light, or for those who want a stylish bag that will stay out of their way. The $342 price tag can be tough to swallow — especially when other bags carry far more stuff for far less money. What this really comes down to is the uniqueness of the design (there’s nothing else quite like the Flat Pack) and the quality of Hard Graft products. This is the second Hard Graft bag I’ve purchased, and both of them are still some of the best leather goods I’ve ever had the pleasure of using. If you demand luxurious, quality construction in a minimal package, you will not be disappointed with the Hard Graft Flat Pack. 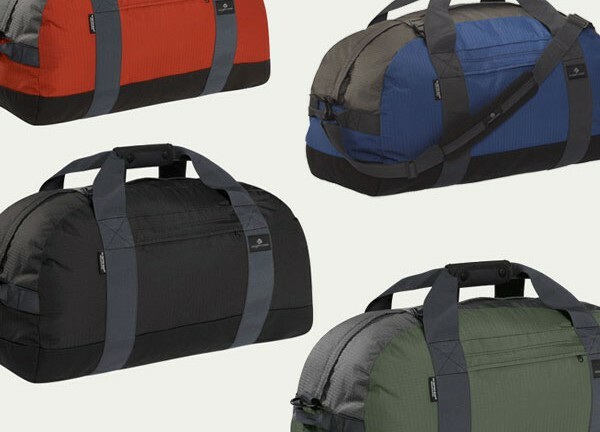 Check out the whole range of Flat Packs at HardGraft.com.